It used to be dark green but, sadly, the green eventually peeled away (actually, I peeled it away, in moments of absent-mindedness). There have been times when I thought it missing forever, and I celebrated as heartily as the shepherd finding his lost sheep when it was found: in the dungeon that lies in the depths of our sofa; within the furthest reaches of a duvet cover (I’m a big fan of writing in bed); in the midst of moon-sized dustballs under my bed. 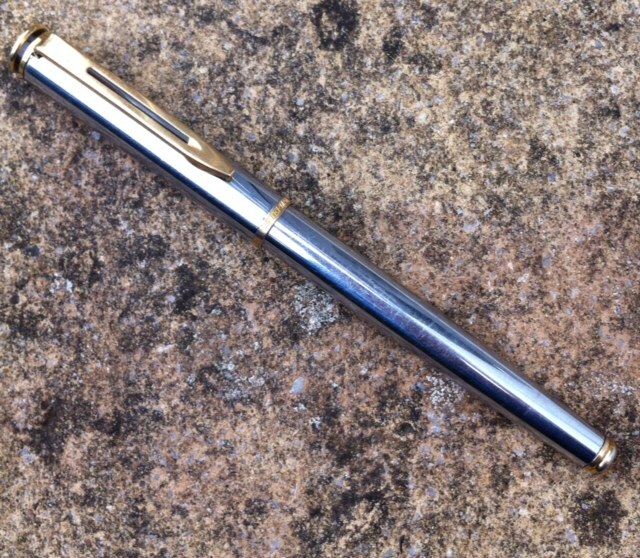 In fountain pen years, this one isn’t so old, perhaps only twenty years, but it’s seen off several desktops and laptops. Its ink has filled roomfuls of pages, but the most beautiful mark it makes is the first touch of its nib at the top of a blank sheet. Josephine, don’t you think a special pen enhances the writing experience? I love pens and paper!! I so love this reflection. Beautifully written thoughts on this week’s theme! What a lovely description of the life of your pen! If this post is any indication, your companion has been the instrument of much beautiful writing. I love this post! A pen that you have had for twenty years? That’s fantastic!